Besides, I know that there are also some parents who feel lonely sleeping alone. So, is it a good idea to share your bed with your kid? Well, I’ve discovered that while it has different benefits, it also poses a significant risk to their development. Just take a look at these factors below! It Can Get Somewhat Uncomfortable For Your Child! Of course, it’s relaxing to cuddle in the same bed with your kid. That’s why I like inviting my daughter to bed whenever I’m feeling tired after a long day. Sadly though, I noticed that she does not enjoy the same level of comfort. At times, she complains of sweating too much, and my somewhat intense snoring. Most importantly she feels that my mattress is not comfortable. I realized that not all types of mattress brands have the same luxurious feel. Therefore, although they may be children, sleeping on a grown-up mattress does not necessarily mean that they’ll love it. So, even though it broke my heart, I had to abandon the practice! As a single parent, I’m usually involved in different aspects of my daughter’s life. From attending dance classes to attending career days, I’m always there. You probably think that this is enough for a parent right? Well, no! She’ll often get into my bed whenever a lousy dream ‘visits’ her or when she’s watched a ghost movie and thinks the ‘boogie man’ is under her bed. While I can’t send her back to bed, I feel that I’ll have a huge problem to deal with in the future. Here, I ask myself questions like “how will she learn to handle her fears?” or “will she keep crawling into my bed until she’s sixteen? “The bottom line is that as parents; we’re just encouraging them to be insecure and over-reliant on us. 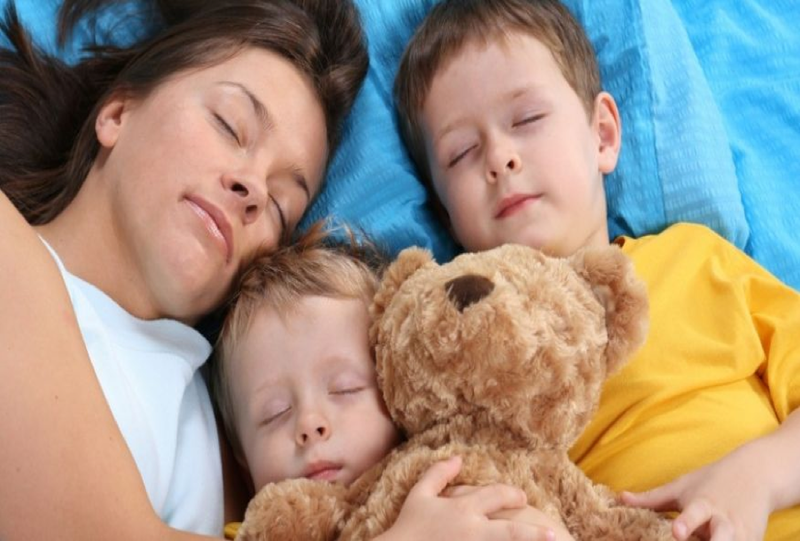 Reports show that close to 50% of parents living in the United States love sharing a mattress with their kids. If you’re a lactating mother, you’ll have increased milk supply, and you’ll enjoy breastfeeding your child. Furthermore, when you finally decide to put your baby in his or her crib, you’ll have no bedtime battles. “Babies usually have an inborn desire to be held and touched.” This finding is according to Dr. Susan Markel, an author and pediatrician. She goes on to add that they need physical closeness both day and night. Newborns who don’t sleep close to their mothers don’t sleep well, and a majority of them even suffer from stress. My daughter has had a few issues when it comes to breathing. Our last visit to the doctor showed us that her lungs clog up with mucus during the night, which makes sleeping rather uncomfortable. However, when she’s sleeping beside me, I can track her breathing rate better and attend to her when it gets worse! I would love to have some tips on writing from whoever wrote this.